Affiliates - Earn 50% Commission! Welcome to my resource page for affiliates. 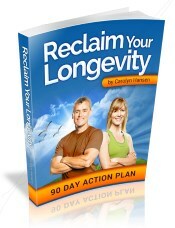 My product Reclaim Your Longevity is one that you can feel confident promoting to a target audience of people interested in learning how to dial up their productivity levels in all areas of life by first doing what it takes to ensure they are physically up to the task now and for the next 50 years of their life. This is what "peak performance living" is all about and it all begins with fitness. Please use the resources on this page to help with your promotions and feel free to contact me with any questions you may have about promoting my product. When you promote Reclaim Your Longevity as an affiliate you will be making a healthy 50 percent commission on every sale that you refer. The main product that you will be promoting is Reclaim Your Longevity, but you will receive commissions for any other of my products that are promoted to the prospect as well. The program currently sells for $197. This means you get to keep approximately $90.61 of every sale (once my sales processor takes its small cut). If you are familiar with pay per click advertising, and know how to create adverts with appropriately chosen keywords, you can run profitable campaigns while you sleep! Or, if you prefer not to dabble with pay per click, you can simply promote my program on your blog, create a page on Squidoo or HubPages, or write an article and place it on EzineArticles or any other popular article directory. These are just some of the more obvious zero-cost promotional ideas. There are, of course, lots of other places that you can use to promote the program without spending a penny. Because ClickBank® manages the affiliate program for my program (see the next section) the customer actually pays ClickBank directly and they in turn pay you. That means your commission is credited to you the moment the sale is processed. You are never waiting on me to pay you. ClickBank pays you every two weeks, like clockwork. If there are any refunds to be handled (very infrequent with my program), ClickBank handles that too. Certainly everyone over the age of 40 years could use the information provided in this product. After all, the main emphasis is on how to slow the aging process, revitalize your life through taking better care of your body, and extending the number of productive years well beyond the usual age of retirement. But the audience that we are catering to most is the "peak performer" crowd. The people who want more out of their lives and who work far harder than the average person to achieve their goals. These are the people most likely to understand the value of adding 20 more years of peak performance living. Plus they are far more likely to actually be willing to pay for the blueprint needed to achieve the goal. Note that tracking IDs in ClickBank consist ONLY of letters and digits, so in the example above the keyword "anti-aging" would need to appear as "antiaging" if it was to be used directly for the tracking ID. On the remainder of this page you will find material to help you with your promotions. Currently there are TWO SQUEEZE PAGES that can be used to offer the visitor a free report. The first of the articles found below will take the reader to a squeeze page that offers my report "Switch Off The Aging Process Within You". Article 01 - How To Live Forever - Almost It would be great, wouldn't it? Being able to live forever? Knowing that no matter how long it takes for the next greatest discovery to be made by mankind you'd be around to experience the wonder of it? Suppose for example you'd been born just 150 years ago. What do you think the high points of your life might be? Sure there would be the first kiss and all the unique personal experiences that no one else can fully share that we'll remember until the day we die. But then there are the sharable moments too. The ones that we can all experience together. The discoveries that remind us that we belong to an incredible species that has scarcely begun its ages of exploration and discovery. Imagine being able to take a walk through the 1893 World Fair at night and see the newly invented Tesla alternating current power sources declaring their imminent victory in the race to light the world. Imagine being able to attend the first "air shows" where eccentric but visionary inventors forced their flying machines off the ground in a risky but glory-promising bid to finally attain manned flight. Imagine being alive when newspapers sounded the amazing triumph of an unknown scientist named Einstein who had correctly predicted the crazy ability of the sun to bend rays of starlight in a universe that warped and buckled because, as it turns out, mass and energy are equivalent and space and time are different manifestations of the very same thing. Maybe you were alive when Neil Armstrong set foot on the moon and became the first man to walk on another world... Wouldn't you like to be alive when the next one is Mars? When we finally bridge the gap between planets for the first time? I know Carolyn Hansen would. She is a health and fitness professional who thinks a lot about what it takes to get the most out of a life span. Your life span, if she has any say in the matter. 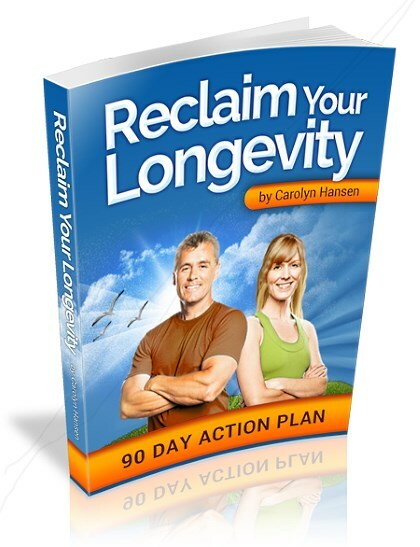 Carolyn recently came out with a new product she calls "Reclaim Your Longevity" and to help you get an idea of what it is about, and how it can benefit you, she is giving away an ebook of hers called "Switch Off The Aging Process Within You". So if you're at all concerned with where you want to be 30 years from now, 40 years from now, or longer, I highly recommend checking out the book. It's free right now for people who don't need to be sold on the idea that living as long as you possibly can might not be such a bad idea if you can swing it: Click here for your copy of "Switch Off The Aging Process Within You" And hey, if Mars isn't your thing... Wouldn't you at least want to stick around until they've introduced that flying car you always see in the old sci-fi movies? That's what I'm holding out for. That and non-fattening donuts. Although you will find the hoplink that takes the prospect to a squeeze page in these promotional articles and emails (because they both promote a free report) you can always CHANGE the emphasis of the article or email if you want to, and promote the sales page instead. In that case you would use the standard hoplink. However you will probably find your conversion rate tends to be higher when sending prospects to one of the squeeze pages. This is because the prospect will see the sales page anyway (right after opting in) and they will be marketed to in the days ahead using the auto responder sequence designed to promote this product. Your affiliate URL will appear on follow up emails that go out during this time. So, if you want to have your tracking ID recorded as a "lifetime cookie" in our system use the additional ttid variable. If you do this we can then append the value to hoplinks in promotional emails (as the tid variable) along with your Clickbank affiliate nickname. Note the page variable that redirects the user to the relevant squeeze page. The SECOND article (found below) will take prospects to a squeeze page that offers my other report "Reduce Your Disease Risk By An Astonishing 80 Percent". Article 02 - How To Reduce Your Disease Risk By An Astonishing 80 Percent Is it really possible to live a disease-free life? According to health and fitness professional Carolyn Hansen the answer is "most definitely". She says that long term studies have proven that you can rid yourself of up to 80 percent of the disease risk that plagues many people and ends up cutting their life unnecessarily short. By decades, in some cases. I am sure I don't have to point out the benefits of being able to live a life free of the risk of disease. Of course that's not what she's claiming here. Just the ability to reduce your risk to one fifth of what it otherwise might be. But just to play Devil's Advocate, what ARE the benefits of being able to lower your risk by such a large amount? For one thing, your life duration expectation goes way up. Instead of sticking around for just 70-80 years, maybe now you get to live to see your 100th birthday. Even better than that - you get to live out the later years of your life without having to deal with the slow torture that failing organs inflict on the disease-ridden. Kidney disease is no fun. Nor is pancreatic, throat, lung, bowel or skin cancer. Even plain old diabetes can completely hobble you and cause the slow shutdown of organs and the necessity to rid yourself of the furthest extremities in a bid to just keep going... No. Disease, if it can be avoided MUST be avoided if you are presented with any reasonable course of action that would allow it. So what's the secret? What do you need to do to wipe the slate and regain the years that disease may get preparing to rob from you even as you read this page? Carolyn says that by adopting just FOUR simple lifestyle habits you can eliminate 80 percent of the risk for the BIG diseases, the ones that claim the lives of millions every year and swell the ledgers of the "prematurely deceased". What are those magical four habits? Well, you'll need to read her ebook "Reduce Your Disease Risk By An Astonishing 80 Percent" to get the answers. But the good news is that it is free: Click here for your copy of "Reduce Your Disease Risk By An Astonishing 80 Percent" Better still, it turns out that those habits are nothing outlandish at all. In fact you may be doing at least one of them already. But it's missing out on the benefits of the other three that might end up killing you. And that's why I recommend you go read the book now. That and the fact that I've always wanted to be able to say "Go read this book now. It may just save your life..." and actually have it be true. In this case, it is! The basic Reclaim Your Longevity offer is presented on the thank you page seen after someone opts into the squeeze page to which you have sent them. If you would like to use this as an opportunity to present a HEAVILY DISCOUNTED (50 percent price reduction) version of the product then use either of the following two URLs that introduce the rid parameter to initiate the discounted RYL as a one time offer. That means no matter what your list may be interested in specifically, they are likely to find this subject hard to ignore. That means you can broach the subject with them and use the Reclaim Your Longevity squeeze pages to get them to take action. From there, my automated follow up auto responder sequences will do the job of alerting them to the benefits of the Reclaim Your Longevity program. Your target audience should be anyone interested in learning how best to dial up their productivity levels in all areas of life by first doing what it takes to ensure they are physically up to the task now and for the next 50 years of their life. This is what "peak performance living" is all about. This will be achieved through the proper application of exercise and nutrition.